Equity savings fund is a new variant in the equity mutual fund basket. They had emerged after the Union Budget 2014 increased the holding period for debt mutual funds to qualify as a long-term capital asset from one year to three years. The funds aim to generate returns from equities, arbitrage trades, and fixed income securities. To retain equity taxation, funds will restrict the fixed income (debt) exposure to 35%. Besides, to reduce volatility and hedge the portfolio, these funds actively use derivative strategies. Some amount of equity (15-40%) is unhedged to prop up the returns of the portfolio and the rest of the portfolio is hedged to gain from arbitrage opportunities. The equity and the derivative exposure are considered as ‘equity’ allocation and hence, these categories of funds are treated as equity funds for tax purpose. The basic idea is that they invest a third in equity, a third in arbitrage and a third in fixed income. All of us understand equity & debt, but let us understand the arbitrage strategy. Let us assume that ABC Ltd. trades on NSE cash market at Rs.100 and Rs.101 (same month futures price) in the futures market. By the end of the month, the future price converges with the cash price. Buying in the cash market and selling in the futures market will entitle a gain of 1%. If we assume a 0.2% brokerage for these transactions, then the net gain is 0.8%, or an annualized return of 9.6%. Thus the risk profile is fixed income but their tax profile is that of equity. These are conservative funds. They can be looked at as MIPs which are treated as equity funds from a taxation point of view, thus making your long term gains tax-free after one year instead of three. Fund managers opine that there are significantly higher arbitrage opportunities in a bull market, but lesser during falling or flat markets. If you plot the fund categories on a risk-return axis, equity savings funds are positioned between MIP funds and balanced funds. They stand a notch higher than MIP / debt-oriented funds, and one notch lower than balanced funds in their risk-return proposition. From a utility point of view, conservative investors trying to seek income from their investment and not wanting to assume great risk should look at them. 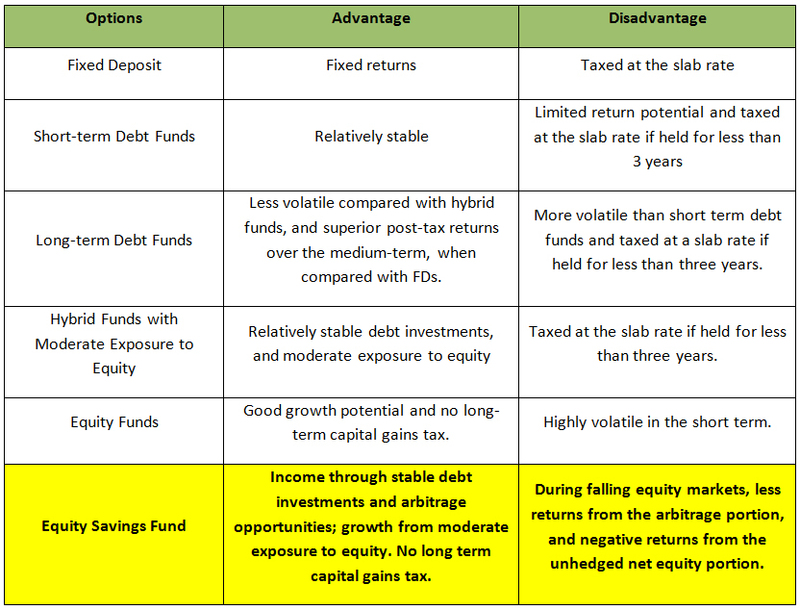 The following table summarizes a comparison between different investment avenues. Some motivation for the day!